How many people can claim to have more than one life-changing experience in a single summer? Northwestern State University sophomore Dalton Randolph can. He spent the last month touching dozens of lives at summer camps for children with disabilities through the Build America Xperience, which is a project of the Pi Kappa Phi Fraternity’s philanthropy, The Ability Experience. Randolph participated in a special version of Build America, a six-week team event where Pi Kappa Phi members travel the country promoting accessible recreation for people with disabilities. From the construction of accessible amenities at camps to wilderness adventures with athletes with disabilities, the Build America team is dedicated to proving true human ability. Throughout the summer, the team logs over 4,000 man hours, save camps and communities $50,000 in labor costs, over $30,000 in materials expenses and impacts the lives of thousands of people with disabilities. For the month of July, Randolph spent a week at each of three camps in the Midwest. “There was a lot of driving screws, pouring and mixing concrete, making measurements and cutting materials,” he said. At Camp Wawbeek in Wisconsin Dells, Wisconsin, the Pi Kappa Phi members painted and reorganized a sensory room, as well as constructed a 32-foot stationary train for a playground. Team members restored parts of a thousand-yard nature trail in Rocky Mount, Missouri at Wonderland Camp. In Martinsville, Indiana, the Pi Kapps built a horse run to provide shade for campers and their horses. Randolph’s summer break has been one of experiential learning. In June, he attended the highly-selective Pi Kapp College for Emerging Leaders, a transformative leadership institute for members of the fraternity. There, he learned how to identify and capitalize on his strengths as a leader. The Ability Experience, formerly Push America, is a 501(c)(3) nonprofit organization that serves people with disabilities. 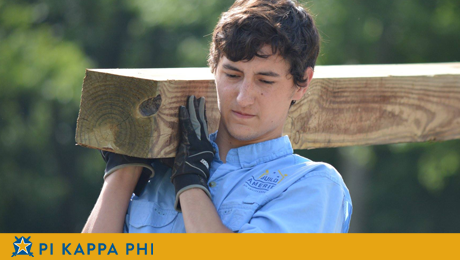 The Ability Experience was founded in 1977 as the national philanthropy of Pi Kappa Phi Fraternity with the purpose of instilling lifelong service in its members and enhancing the quality of life for people with disabilities. Although the organization is still fulfilling the purpose for which it was intended, The Ability Experience has grown into a nationally recognized nonprofit with numerous programs educating undergraduates, alumni and communities about the abilities of people with disabilities. July 26, 2015 in Service.